Mr Al-Dadah went to school in Ayrshire and graduated from Dundee University Medical School. He completed his higher surgical training as a specialist registrar on the Cambridge training programme. He then completed sub-specialist fellowship training at the Professorial Knee Unit – Southampton, Avon Orthopaedic Centre – Bristol, London (training in cartilage transplant) and Belgium (training in meniscus transplant). 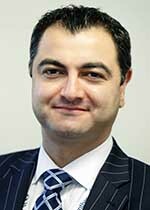 Mr Al-Dadah has a specialist interest in all aspects of knee surgery including sports injuries and joint replacement surgery. He performs arthroscopic (key-hole) knee surgery and ligament reconstruction, knee osteotomy (bone realignment) for young patients with arthritis, partial knee joint replacement surgery using minimally invasive techniques as well as total hip and knee replacements for arthritis. He also performs revision (re-do) knee replacements. His current consultant practice also includes general trauma with a particular interest in complex knee trauma as well as treating children with knee injuries. Mr Al-Dadah completed his Doctorate Thesis on the topic of Reconstructive Knee Surgery and is the Editor-in-Chief of The Knee Journal. He is actively involved in teaching and training medical students, junior doctors, physiotherapists, allied health professionals and GP’s and is often invited to deliver instructional lectures in his field of expertise at scientific meetings. In his spare time, he enjoys spending time with his family, football (captained medical school football team), tennis and gym. Mr Al-Dadah completed his doctorate thesis during his research fellowship on the topic of Reconstructive Knee Surgery under the auspices of two experienced professors including the past president of the British Knee Society. Mr Al-Dadah’s research has been published in peer reviewed journals and presented at national and international scientific meetings and has won prizes and gold medals for best podium presentations. Mr. Al-Dadah also completed postgraduate research training in the fields of medical statistics and research methodology, including Randomised Controlled Trials, Systematic Reviews and Meta-Analyses at Oxford University. He is an Honorary Clinical Senior Lecturer at the Institute of Cellular Medicine at Newcastle University. He is active in both audit and research and regularly attends national and international meetings and conferences to ensure that he provides an up-to-date and evidence-based medicine approach to his clinical practice. His strong academic pedigree lead to his current appointment as the Editor-in-Chief of The Knee Journal. He is also the Programme Director of the South Tyneside Basic Surgical Rotation. He is the Foundation Programme Tutor where he supervises and co-ordinates the whole Foundation Doctor Training programme for all the FY1 and FY2 junior doctors at South Tyneside. Mr Oday Al-Dadah does not hold a share or financial interest in this hospital, another Nuffield Health hospital or the company. Mr Oday Al-Dadah does not have a share or financial interest in equipment used at this hospital or another Nuffield Health hospital. Mr Oday Al-Dadah does not hold any paid advisory role(s) at this hospital or on behalf of Nuffield Health.